Line 2 large baking sheets with parchment paper. Preheat the oven to 250 degrees F (120 degrees C). 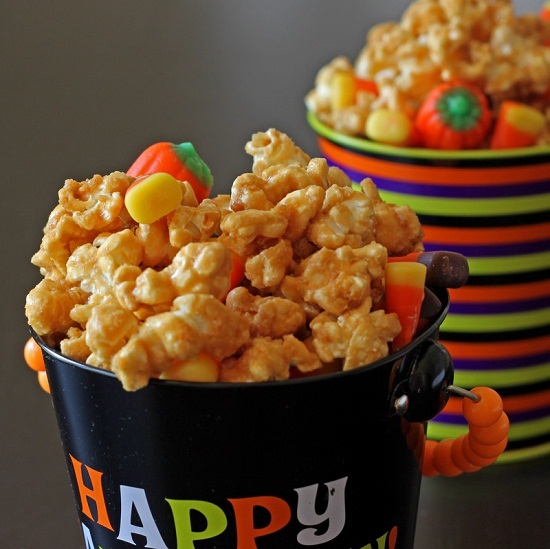 Make popcorn and place in a large bowl (or 2 large bowls). I actually used a double bagged brown bag from the grocery store. It worked great and cleanup was easy! Combine the brown sugar, corn syrup, butter and salt in a saucepan. Bring to a boil over medium heat, stirring enough to blend. Once the mixture begins to boil, boil for 5 minutes while stirring constantly. Remove from the heat, and stir in the baking soda and vanilla. The mixture will be light and foamy. Immediately pour over the popcorn in the bowls or bag. Stir to coat. Bake for 1 hour, removing the pans, and giving them each a good stir every 15 minutes. After it has baked separate into pieces if need. Allow to cool completely, then store in airtight containers or resealable bags.